In my guise at Swarthmore College Alumni Council President (2011-2013), I had the great pleasure of meeting Donna Jo Napoli, Professor of Linguistics, at a reception in fall 2012. We chatted merrily and Donna Jo mentioned she wrote children’s books. Later, when I googled her, I discovered she had written over 70 books!!! And had won many awards! You can read about Donna Jo here. 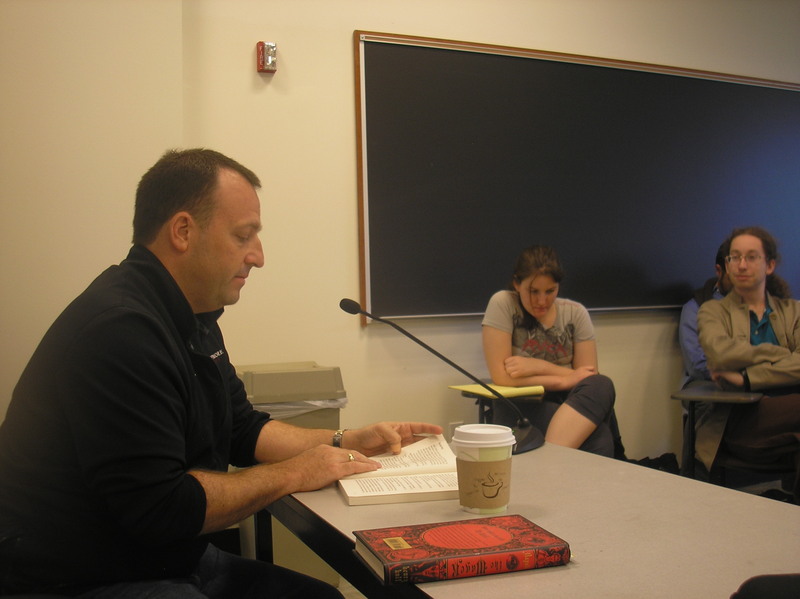 At the same time, I had know that one of the Alumni Council members, Josh Green, Class of ’92, had written a Young Adult chapter book, The Idea Man. That he did when he wasn’t working as an emergency room doctor or Hawaii State Senator!!! The poster for the event designed by my brilliant daughter, Sarah Kilfoyle. Thanks, Sarah! 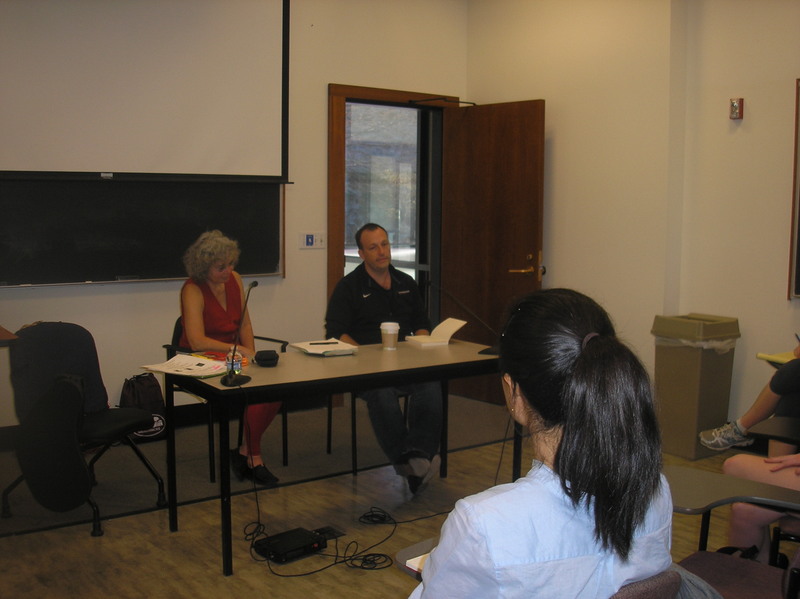 It consisted of readings, Q & A, student input, and signings. 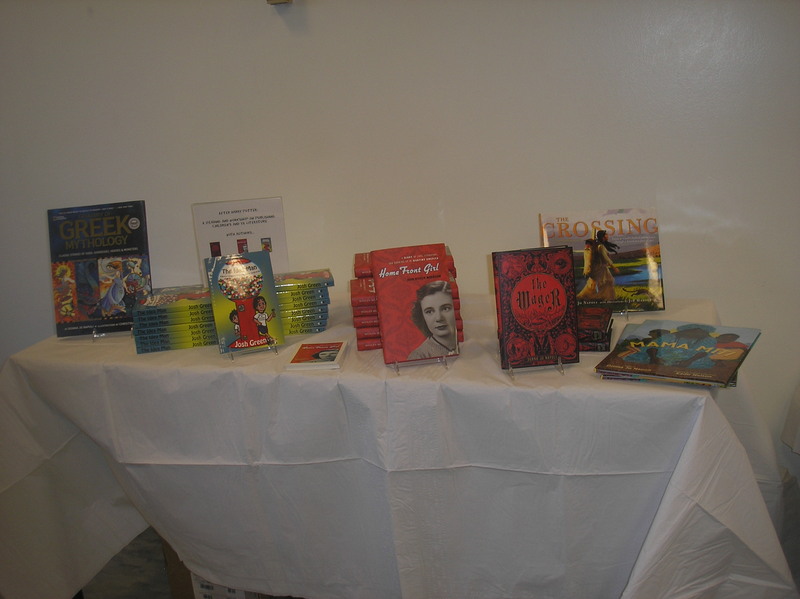 Book Display at Swarthmore Event with Josh Green’s The Idea Man, Susan Morrison’s Home Front Girl, and Donna Jo Napoli’s The Wager, Greek Mythology, Mama Miti, and The Crossing. Josh read from The Idea Man, I read from Home Front Girl, and Donna Jo read from The Wager. Over 20 students participated, along with a number of older folks. They clearly had great interest in Children’s and YA literature. In fact, about half of them said that they were working on their own children’s and YA literature. Two young women told about how they were collaborating on a children’s book; one doing the writing, the other the illustrations. After I told about how I had written a Harlequin Romance named Stairway to Love (unpublished–so far!) 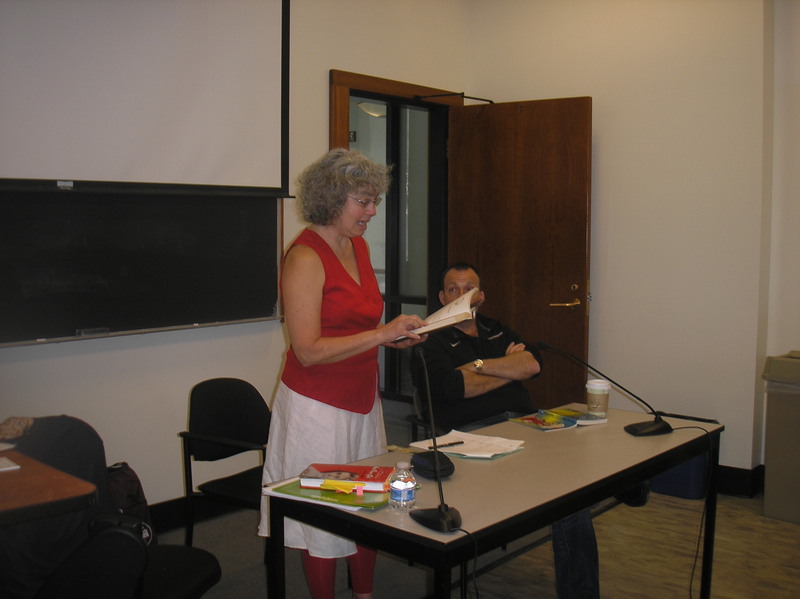 when I was a freshman at Swarthmore, Donna Jo encouraged that students to write anything, any genre: from erotica to SciFi to Children’s books. 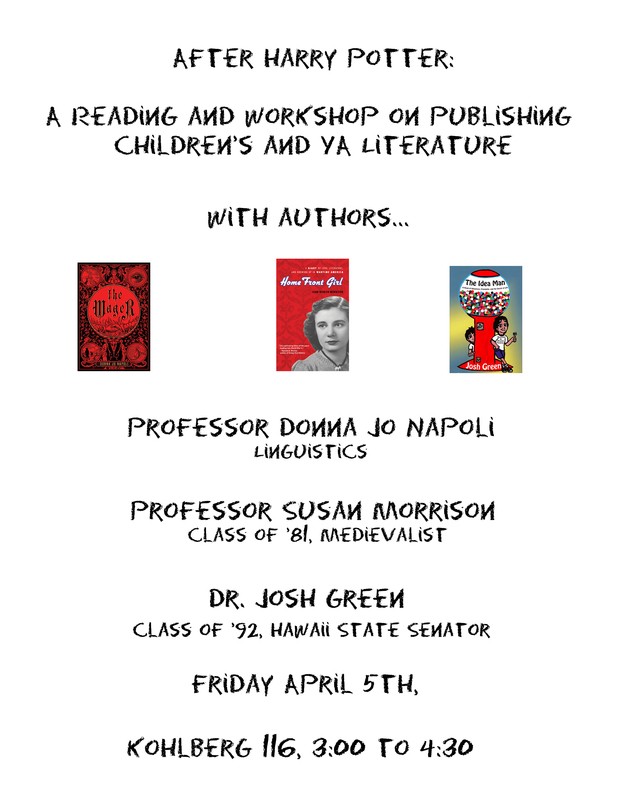 I hope the students form a writing group focused on Children’s and YA literature! We’d love to support you! Everyone should witness this incredible video of Donna Jo’s TEDx Swarthmore talk on What Children (and Everyone Else) Need to Know. It’s about censorship and how children (and all of us!) need to read things that may not be happy– because such works of art help foster empathy. Thank you, Donna Jo, for your incredible presence in the world of Children’s and YA Literature and being a leading voice! Here is an article about the event in the Swarthmore Bulletin. The event with Donna Jo and Josh came about because I work with a wonderful team. 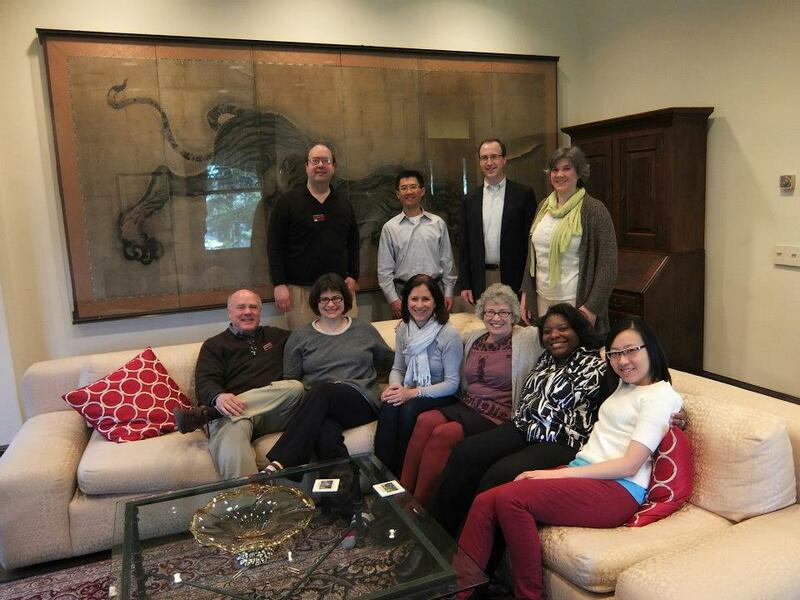 Here I am with my wonderful executive committee at Swarthmore College. Posted in Susie's Blog and tagged Donna Jo Napoli, Home Front Girl, Josh Green, Sarah Kilfoyle, Susan Morrison, Swarthmore College, TEDxSwarthmore Talk, The Idea Man, The Wager, What Children (and Everyone Else) Need to Know. Bookmark the permalink.